I talk to lots of people who don’t make budgets…shame on you. A budget is telling your money where to go instead of wondering where it went (thank you Dave Ramsey!). Did you know that if you make a budget you usually end up finding out that you have MORE money than you thought? It’s true. So, make more money and work out a budget. See how easy it can be to set good priorities? That’s all a budget is – priorities on paper. It’s pretty easy to make a budget, it just takes time and effort. Here’s a great free budget template that we use. I love my budget. It’s a security system for me. I don’t have to wonder how much money I have…..I KNOW. I can see it. If it’s getting close to the end of the month, I can look and see how much I have left – not cry at the register because I’m afraid that I don’t have enough to buy my toilet paper….and no toilet paper is a crying matter, my friends. When you think about starting to make a budget, you have to consider three things – needs, wants and wishes. It’s critical you understand these things before you begin a budget…..or else you’re in trouble. Big trouble. Up poop creek without a paddle…..or toilet paper. I bet some of you don’t know this one….you’re so used to “needing” 23,498,237,492,873 things that your judgment has become skewed. Even I go through periods where I think I NEED something….but I don’t really. Sure, that pair of clearance shoes looks pretty good – I don’t need them though. Yes, I need shoes – however, my pairs at home could last me for a while. Needs are those things you cannot live without. I can live without a pair of cute shoes……YES, I can. When I say “needs” I mean the essentials – food, clothing, shelter, & medical care. This includes your house payment, your budget for groceries (but don’t go overboard), adequate clothing (hello Goodwill! ), and money for medical expenses (if needed). Your budget should always cover your needs first. They are what you budget toward AFTER you pay for all your needs. Baby might want candy, but does Mommy have the leftover money? You are not depriving your children by making them do without things. You’re simply teaching them to wait for things they really want. This is a microwave society. I want it and I want it NOW. The word “no” isn’t going to kill your children. What doesn’t kill them only makes them stronger. 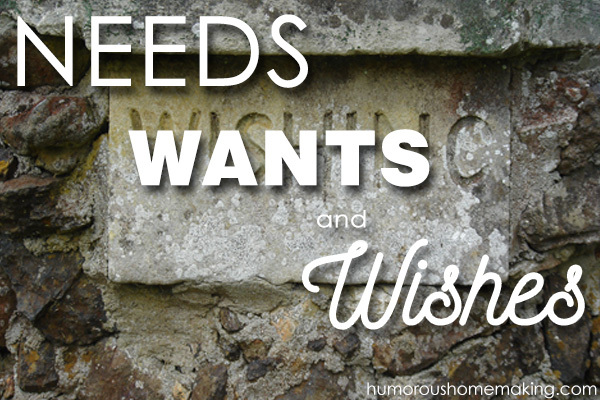 Wants are basically all the things that don’t fall into the needs category. Teach your kids to work hard for what they really want. Don’t teach them that if they want it now, they can just go plunk down their Discover card and pay for it later. Things that might fall into this category are: eating out, gym membership, movies, cosmetics, cute shoes. After you budget for all those things you need, you’ll know how much money you have to put towards your wants. It will teach you to really think about what you’re spending on. It’s a good discipline to have. Be an adult. 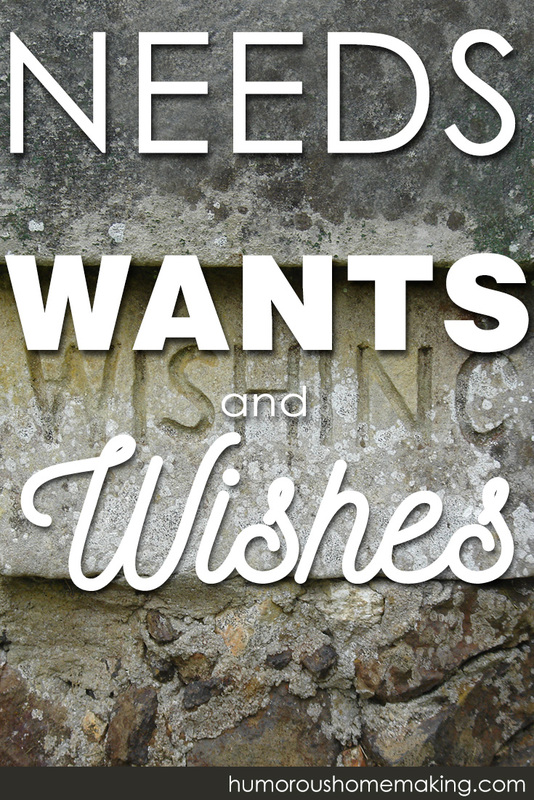 You NEED to have WISHES. They give you something to work toward. I like to think that wishes are those things that you’re able to afford occasionally after you are out of debt. I’m wishing now for a nice house in the FAR country where I can walk around in my underwear if I want to without the neighbors thinking I’ve lost my mind….or where I can go out onto the porch without the whole neighborhood knowing I’m awake now. If you’re always getting your wishes, you really don’t have anything to look forward to – and you really aren’t looking forward to getting out of debt. Dream and wish big because when you’re out of debt, you’re going to be able to pay for them……and that should be enough to keep you from putting that cute pair of shoes in your buggy. What is one BIG dream you have? Deprive your child and see how creative she can be! ;-P Willow made a scooter out of a broom and a swing out of a telephone. We even had to push her on her swing while she said, “whee!” Now, neither worked very well, but it was enough for her. Totally agree! I have seen things this week that makes me sad of the way peopple think about them selves. But on the other hand those who have nothing and tell me they have everything and are blessed. I am so blessed to have what I have.